This winter we bought an RV and started making some general plans for trips, but we hadn't found time to do some repairs and spruce-ups that we wanted to do. Well, the weather was fantastic this weekend, and we got started. Friday, we went to a hardware store and bought water hoses, pipes and connectors. H spent all day Saturday working on getting the water system operating properly and making sure there were no leaks. Saturday we went to the local RV store and got some other hoses, putty tape, etc. and scheduled maintenance on the LP gas (stove, heater, hot water) for this week. I spent a little time as "gopher", you know, "go for the phillips head screwdriver", and "hand me the wrench". Sunday, we went to Home Depot and looked at things we might want to have in our traveling home away from home. All we bought was a portable vaccuum cleaner for quick clean ups. Today (Monday) H worked more on the water system, disinfected all the tanks, lines, etc. Wait a minute, this is not the RV blog, where's the crochet content? Okay, when we were out on Friday, we went to the WalMart in Mechanicsburg, not the local one we were at last week. I found the variegated yarn for the purple afghan, but not the light pink thread that I wanted. We went to the AC Moore in the same shopping center, they didn't have the thread, either. Saturday, after the RV store we stopped at JoAnn Fabric. No light pink thread, in fact, they had barely any thread at all. But their yarn selection is looking good. On our Sunday shopping we stopped at Michaels, again. I selected a light pink in Cebelia #10, though I was rather sure that it was just tooo close to the pink I alread had. I also selected some embroidery floss in a "light baby pink". In the evening, I tried both of these and didn't really like either with what I already had. Believe me, there was going to be no ripping back just to change colors. I can select other colors if I use this pattern again. So, last night I started with the white. I think it's going to look very good, just not spectacular. I think that the stitch patterns are complicated enough that it will be a good entry for the county fair, as hoped. Well, I have learned a lot on this project. I also started working on another light lap cover for my aunt. She's in a nursing home following surgery, and last time I visited she had a pretty little thing made out of dishcloths crocheted together. She asked if I could make her one, so we went to the WalMart and got some dishclothes, pastel variegated thread and a steel hook. I whipped one up that weekend. Since we're going to be in town this weekend for a family reunion, I'm trying to get a second one made, maybe before we leave for the weekend, maybe while we're there. For this I selected some beige washcloths that have red/pink roses. I started with a #9 hook for it's sharp point, and used it to poke holes and do a single crochet, chain 3 around the outside in shaded greens. Then I changed to a #5 and dark red thread and I've working a little shell pattern around. I think that the next round will be shaded pinks, and then join the 4 washcloths together. I have a busy week, trying to finish up these small projects, getting ready for the trip, and it's 2 weeks before the dance recital so I have some extra projects. Tomorrow I probably should hem some scarves for the belly dancing costumes. Or at least get a good start on the project. Today I finished the last row of the light pink, while working I thought about the next section being white. I really would love to have a third shade of pink, Michaels didn't have a third choice. So today I spent a lot of time online searching for thread, then went shopping at WalMart and AC Moore, and didn't find a lighter pink. I'm looking for a pink that's just barely pink, just a shimmer of color. I'll do a little more shopping tomorrow, but I may have to go back and finish with the white. Possibly the last round in shaded pinks to tie everything together. We'll see what tomorrow finds. I'm been crocheting seriously all day, making great progress on this doily. I just finished round 20 of the 31. (For us math crazies, that's 20/31, not a pretty fraction!) But we can round off and say that I'm about 2/3rds finished! Wednesday morning I was crocheting on the doily, really loving the pattern. I have a new favorite designer! Being a crazy math-loving person, I like to assess progress. I check occasionally and say "I'm 1/6 of the way around this round", or 1/4, 1/3, 1/2, etc. So I decide to check my progress before taking a lunch break. The previous round has scallops of 9 double crochets, some worked in the back loop only of the previous round. The current round is a complicated arrangement of double crochets in doubles in the current round and overlaying double trebles into the open front loop of the doubles in the round below. I count that I've completed 4 of these scallops, I'm 1/3 of the way around. That leaves 2/3, but wait, 2/3 has to be an even number, it doesn't look right. I count - 7 scallops left. what? I recount - clockwise, counterclock wise, from the back, doesn't matter how I count I've only got 11 scallops :-( I count previous rounds trying to find my mistake, looks like it was right at the beginning! Too much coffee and chattering while starting a new pattern? I'm going to have to rip it all out. Since I'm starting over anyway, I think about other ways I could do my color changes, maybe only use 3 colors. Where would I change? The pattern has some fabulous texture, remember those overlays? There are also post stitches, clusters and split doubles, etc. I think it might look cool to have the rounds of overlay in a new color. So I start with the dark pink, and when I get to the round of overlay stitches, I switch to the light pink. I started this doily Tuesday evening at our Stitching in Public session at Borders. We crochet, chat, look at books & magazines, drink coffee, chat more, crochet more, etc. I usually like to take a project that doesn't require a lot of focus on the pattern, because we're chatting a lot. The picture is a little blurry in the center as I scanned it, and had the lid open a little. I didn't want to flatten the texture. Right now I have a design I really love on the Tunisian hooks. It's a sportweight yarn and a size K wooden hook, and my own design. Fun, fun. In yarn I'm working on some ideas for the latest "It's all about the Purple Afghan". Haven't made any final decisions, will probably go out to AC Moore tomorrow to look at yarn. In thread, I pulled out a book I bought several weeks ago, Extra-Special Doilies by Mary Werst. I bought 3 balls of # 10 thread, dark pink, light pink, and a variegated pink. I'm playing with coloring sections. I like the idea, will post pictures as it progresses. I took a little break from crocheting since I had finished up the contract work and the runner. I had about 2 weeks before having another motif ready for the Crochet-a-Long, about 2 weeks before the next CGOA meeting, and a month before the next class I'm teaching at Michaels. I read several books including Two Sweaters for My Father: Writing about Knitting by Perri Klaas. This book is about so much more than knitting, I should write a review. I took about 5 bags of yarn and thread to the basement and sorted them into their respective tubs. I thought I was going to get a little cleaning up done in the living room. But after about 24 hours, there I was bringing 2 armloads of yarn back upstairs, and playing with the Tunisian hooks. I swatched all kinds of stitch patterns before settling on something non-Tunisian for the next afghan I'm going to do. But I think I will do the next white baby shawl in Tunisian. I have about 10 skeins of sportweight yarn, only it's 1 or 2 of several different kinds. I'm thinking it might work up as a scrap 'ghan, all the same color and different textures. We'll see about that down the road. I took a trip with my hubby to Strasburg, we toured the Train museum, spent several hours climbing around engines, and train cars out in the rail yard, and took a steam engine ride to Paradise. Then we came home and I settled into crocheting this afghan. Yesterday I finished & blocked the Cathedral Lace runner that's for my sister. It's from the Nov/Dec 1990 Hooked on Crochet! I hope to have a picture soon, but I have to get out the digital camera, etc. I really like the smaller items that I can just pop on the scanner, & upload to the site. Tonight was Shawl Ministry night, and I worked on the blue & coral ripple. Slowly but surely. 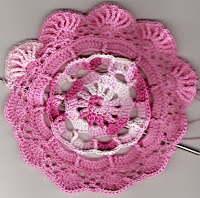 Then I spent most of the evening looking at the beautiful doilies on this site "Mimi's crochet page" It sent me to thinking about using color in doilies. I've got a lot of new WIM (Works in Mind) and a stack of newly printed patterns. Next thing you know I'll be back at that site I posted a few days ago about the pretty colored thread! Last night I said this was from Celt's Vintage Crochet, but I was wrong. The above link should take you to this pattern. By the Way, I saw a photo of this doily that someone had done in blue & white, but she had reversed the colors, so the white was center and outside. It gave the doily a totally different look. The contract pieces are all finished, packed and shipped. 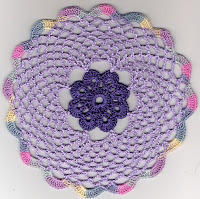 I relaxed Tuesday by making the May selection at "Doily of the Month"
one of many Yahoo crochet groups to which I belong. 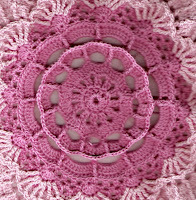 This pattern is called Two Tone Doily and is available at Celt's Vintage Crochet. The pattern is very simple, I finished it easily in less than a day. Okay, I didn't completely finish, it got too dark to do picots in dark purple thread, so I had to put it down Tuesday evening. I worked Wednesday and by the time I got home & picked it up again (after 10 pm) it was again too dark! This morning I finished the picot round, and this evening I blocked it. I should have a picture ready to post tomorrow. I have the urge to start on another doily, something a little more challenging, since I finished the one I selected for relaxing. Maybe I'll get out the Mary Werst booklet, Extra-Special Doilies, that I purchased on May 14th, and haven't gotten into yet. Or maybe I'll finish that runner for my sister, and then get out the book. But I can start thinking about what color I might want to use!!! Ah, on that note, I was searching for online sources of thread for another group, and have an open Window with some beautiful #8 DMC Perle cotton. What a great selection of gorgeous colors. Maybe I'll treat myself to some "extra nice" thread for the next project. "thread at Purse Paradise"
After making the little motifs for the CAL on Antique Threadwork, and designing the little doily from the motif, I couldn't put down the threadwork. I've been busy working on the runner for my sister, it's called Cathedral Lace. The pattern is fairly simple, you just have to keep track on what round you're on. For example rounds 17 -22 are alternating rounds 7 and 6, and those 2 rounds are very similar. 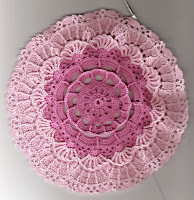 I also decided to start on the Two Tone Doily that was the May choice of Doily of the Month. 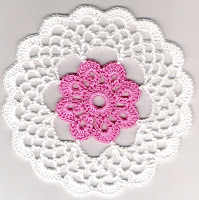 The pattern shows several doilies done with one color and white, but I thought that I wanted to do a light pink and dark pink. I made the dark pink center, but when I started with the light pink, it's a ball of South Maid. How did that get in the stash? I thought that I quit buying that several years ago, the quality is, shall I say, cheesy (to put it nicely). Anyway, I'm trying it with the dark purple and lilac; although I was tempted to go with a light and dark orange. I bought the orange for another project, and who do I know that might want an orange doily? This is the little doily that I made from the CAL motif. I added several extra rounds of "ch 4, sc in loop", then when it looked like it was going to start cupping, I changed it to "ch 5". I wasn't sure that I liked the variegated thread, but I do think the doily is pretty. I might go back to this pattern, and see how far I can extend the lacy portion and make a larger doily. I might add a little "fancy" to the last round, maybe some picots. Don't forget that you can click on any picture and see it in a bigger format. The colors and stitches really show! Tonight I finished up the latest motif crochet-a-long for the Antique Threadwork group. 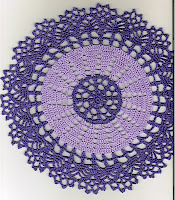 It's a pretty, round motif from 1938, called Galaxy Bedspread, available from Celt's Vintage Crochet. I also started a second motif with purple center and lilac lace. I'm thinking of adding extra rounds of the lacy loops, and making a little doily. I'll post a picture when I get it completed. Yesterday I finished the last contract piece that I needed to get done. It's beautiful, love this stitch design. Wish I could show you and tell you more. When the book comes out in the Fall, and I have a copy in hand, I'll tell you all about it. In the meantime, you'll just have to be satisfied with the other things I'm working on. Thursday night was our local CGOA meeting, Those Yarn Crocheters in Harrisburg, PA. We had 6 in attendance and had a great show and tell time, then we worked on projects that we brought or on learning to work from symbol instructions. I had brought along a large stack of books and magazines with instructions and designs. At least 2 took home a magazine to complete the design that they had started during the meeting. We'd like to plan a "field trip" to another yarn shop soon. I need to get some family plans definitely on the calendar to know what days I have available.